As I have been talking about, I have a goal of redesigning the inside of my house as a garden. 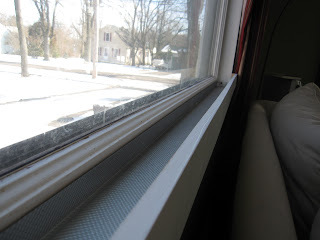 It is a fairly narrow window sill, with a couch right in front of it -- so about my only option would be a row of little pots all along the windowsill. Which seemed... lame. A whole bunch of little pots would be silly looking, and the windowsill isn't wide enough to make them really stable. I'd have to end up buying nice looking ceramic ones, which the cats would end up knocking off and breaking. Which I am pretty happy about. I'm in love with the planter box -- makes even this fairly uninspired combination of random plants I had around (mostly Ficus pumila, plus the odd aeonium, kalanchoe and philodendron) look pretty nice. I'm also planning, next winter, to force a lot of small bulbs (dwarf iris, crocus, etc) in 4 inch pots, so I can slip them in between the trailing fig as they come into bloom. Some small cyclamen would look good too (and yes, I keep my house very cool, so they'll be happy) if I can find some that aren't magenta. Magenta, fuchsia, and all allied screaming purply-pink colors are absolutely NOT allowed in my garden, inside or out. Anyone have other ideas of good plants for this spot? 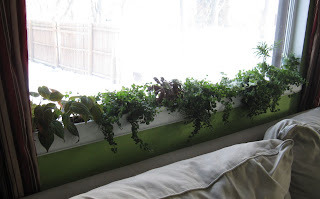 They need to be fine with an east-facing window, not too big, and ideally winter flowering -- and NOT magenta.Oh, and don't say african violets. Way too cold in the house for gesneriads. They live in my overheated office at work/school. Small, like cool temperatures, east window, and winter-flowering? I got nothing. Clivia miniata maybe, though I'm not sure how small they can be and still flower. I have a Dendrobium flowering right now, though I'm not sure about the temperature situation there. Gardenia would work if gardenias weren't impossible. Forced bulbs, but it's probably (?) too late to force bulbs. So yeah. I got nothing. Hmmm... One of my favorite winter bloomers (well, year round for me) is the Rose-type Begonia. I know Rex Begonias have a reputation for being difficult but these guys have been easy for me. I have red, yellow and two different oranges (not pink) in a West facing window. So it depends on how bright your East facing window is. Then again I think I paid less than $3 each for them so I wouldn't mind them as temporary winter color (kind of like my primroses, another option if you don't mind composting them when outdoor gardening season rolls around). That looks great. Cool growing is not something I have to deal with all that often so I'm afraid I can't be much help there. Many Dendrobiums would be alright with the temperatures, but not the light they'd be getting (and likely not staying small, though they don't mind being kept in very small pots for the size of the plant. Light would be the biggest issue I imagine. Cyclamen (the miniatures are nice - they also come in red and white.) Wax/Reiger/Bedding type Begonias. Florist's Cineraria (Senecio hybrids) might also work (not so popular now because they don't like to be warm.) There are also tender primroses that were once favored for cool houses (P. malacoides, P. sinesis.) Possibly miniature roses and freesias. You might even be able to induce an Acacia to bloom in a small (deep) pot before it grows to large. Most of these aren't permanent house subjects, but when the weather turns warm a few (the roses, e.g.) can go outside, and next year who knows? Some cool growing orchid species and hybs. (cattleyas, laelias, oncidiums, etc.) bloom during the winter (their dry season) and could be suspended near the sides. They also could spend the summer outside. Do you have a min/max thermometer? There are electronic ones that also measure relative humidity; I've seen them in the $20-25 range. 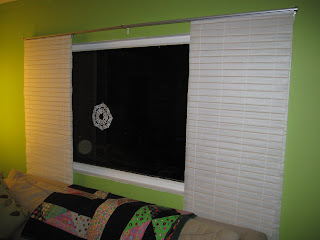 The space between a window & curtain can get surprisingly cool on winter nights, but some plants thrive on that. Some older garden books (Graf's 'Exotic Plant Manual' & 'Exotica', Ballard's 'Garden In Your House') might give you some more ideas. I apologize for going on, your enthusiasm inspired me. Good luck. Both this and the rice art posts are awesome! I have a long standing fantasy of growing a massive indoor epiphyte garden. My current plan is to put my 7' fiddle leaf strangler fig in a big crock and slowly encrusting it with tillandsia, mini orchids and a cutting from my weeping strangler fig. Good luck with the indoor gardening and keep us posted! Great looking window box! No flowering plants sprang to mind that would thrive under those conditions, but I do really like the look of tillandsias and echeverias, and I think they would both tolerate being in a window box. Thanks, to the mysterious Annonymous, in particular -- great idea on looking for older books from when more people kept their houses cool. And you are right -- I should see how much colder it is behind the curtain at night. Redhead, thanks for the sunshine award. I feel very sunshiny now. Late comment, I just discovered your blog. Holiday cacti like Schlumbergera and Hatiora gaertneri would probably do well there. The Schlumbergeras are winter bloomers, come in many colors other than magenta/pink, and can be kept to a manageable size with pruning.